As I was digging yesterday I came across a composition treatise signed "Bar_____ G___n". It's a pretty nasty piece of work, actually. 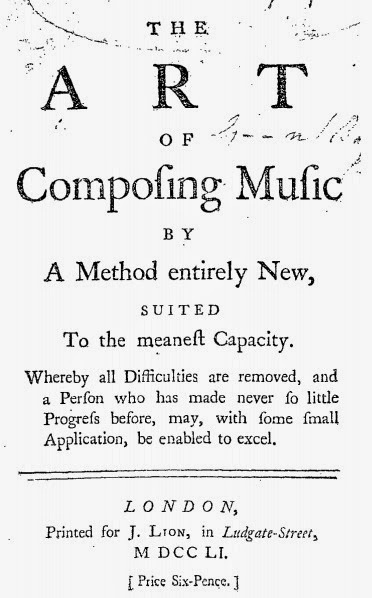 The pamphlet is attributed to William Hayes (1708 - 1777), Professor of Music at Oxford (1741 onwards), who clearly had it in for Birmingham organist Barnabus Gunn (d. 1753). Gunn's supposed 'method' involved the first description of aleatory composition by use of what Hayes calls the 'Spruzzarino', a pen which spurted ink indiscriminately on the page. Hayes also makes a number of comments on Gunn's seeming lack of understanding of the foundations of music. "As the Spruzzarino will not make Flats, or Sharps, you are to place them, where you think they will look best: no matter as to Propriety; the more odd, the more new and unexpected." "As to Quick and Slow Movements, no particular Disposition is required: either with respect to Measure or Modulation; the Technical Italian Words do all." Like I said, pretty nasty stuff. Funny, though. From the music I have been exposed to - The Passions, The Six Cantatas, three concerti grossi, and a number of continuo cantatas - Hayes stands as The native English composer contemporary to Handel. His music speaks for itself, really, and it's a wonder to me why he would make such an effort to antagonize someone like Gunn (whose remaining output consists of one publication of two cantatas and six songs). Of course, there is hardly any data on Gunn today to give us any real picture of their relationship, but can you imagine yourself doing the same today? Hayes became a chorister at Gloucester Cathedral in 1717, was appointed organist at St. Mary's Shrewsbury in 1729, and in 1731 at Worcester Cathedral. Gunn was Organist at Gloucester Cathedral from 1730-39, before he moved to Birmingham. I wonder if Gloucester Cathedral is the connection? Satirical pamphlets were much more common in 18th century England, but printing them was usually done at the expense of the author, which could point to a degree of animosity between the two of them. Unless, of course, this is just a bit of choirboy humor.